We had our family Christmas dinner on Christmas Eve instead this year, so when we woke up on Christmas Day, there was absolutely no pressure of cooking a large meal. Instead, we woke and had a delicious and savory brunch with leftover ham, fruit, coffee, orange juice and these amazing pancakes!!! Don’t get confused by the name because Neil is neither a relative nor family friend. Neil Kleinberg is actually the owner of Clinton Street Baking Co & Restaurant, in which his pancakes were voted best in New York. This pancake recipe is from the “Clinton St. Baking Company Cookbook: Breakfast, Brunch & Beyond from New York’s Favorite Neighborhood Restaurant” by DeDe Lahman, Neil Kleinberg and Michael Harlan Turkell; and if you don’t have the book, it’s definitely worth looking in to. I honestly thought these were the best homemade pancakes I’ve ever tasted. The batter was light, airy, and buttery. The recipe called for whole milk, but we didn’t have any and thus used skim milk. The pancakes were already outstanding, but I can only imagine how they would taste had we used whole milk!!! Fold the dry ingredients into the wet. Whip the egg whites and mix them in with the batter. One secret is that the egg whites are folded into the batter. By applying French techniques – that is, you make a cake lighter by folding in whites (almost like a soufflé) – Neil was able to make the batter lighter, but have it retain its springy resiliency that yields one perfect pancake. The other secret is to avoid over mixing, which creates gluten in the flour and makes them tough. Drop 1/4 of batter onto a hot griddle. When you see bubbles start to form, you’re ready to flip the pancake. One common mistake among many cooks is that they don’t heat the griddle long enough, which is why the first pancake is usually a dud. Make sure the griddle is very hot, then put the butter on. A teaspoon or tablespoon is just fine, but make sure you use enough so the pancakes don’t stick. Optional: add 1 tablespoon of blueberries or sliced bananas and 1 teaspoon walnuts before turning the pancakes. 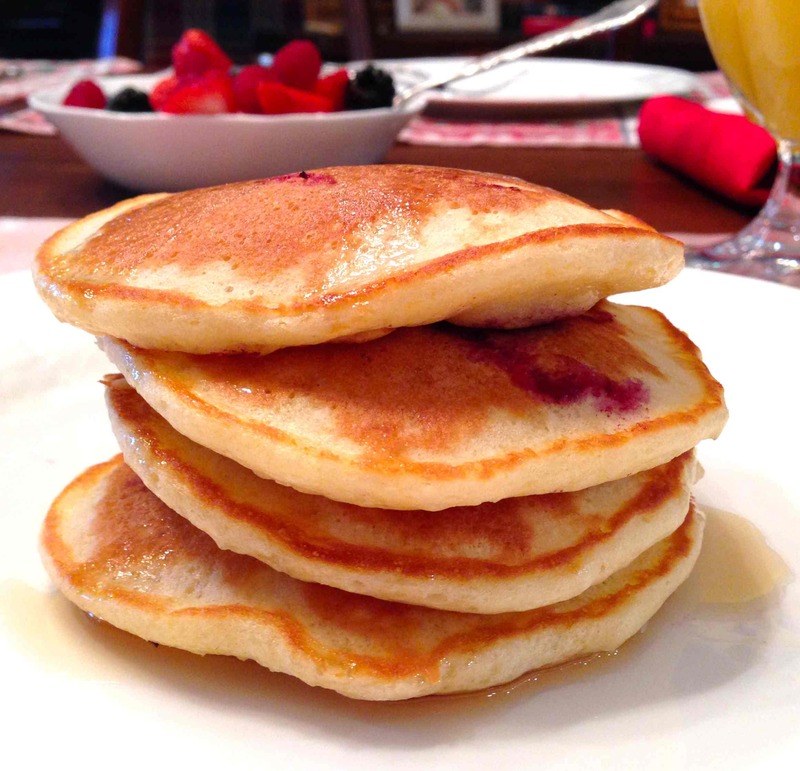 Never add the fruit to the batter; always add the fruit to the pancakes once they’re on the griddle. 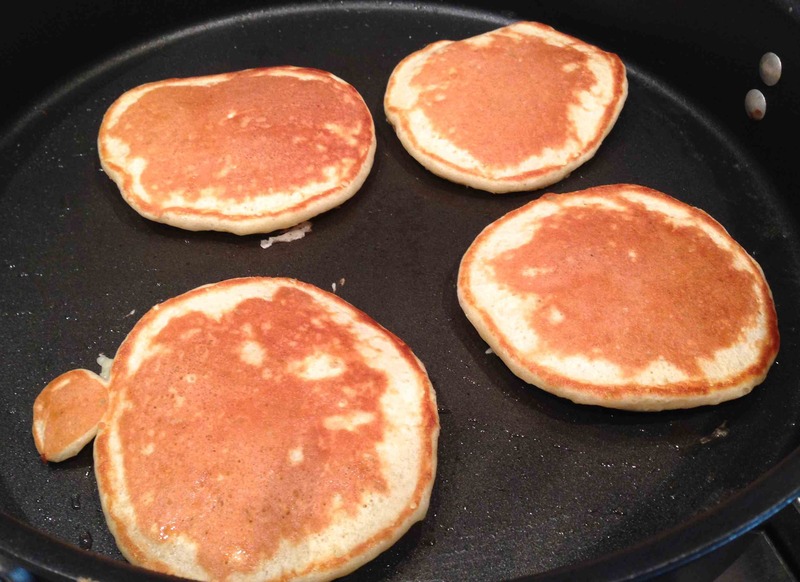 When the pancake is golden brown on both sides, remove with a spatula. Repeat with remaining pancake batter. A nice tall stack of pancakes, drizzled with a touch of pure maple syrup. Yum! 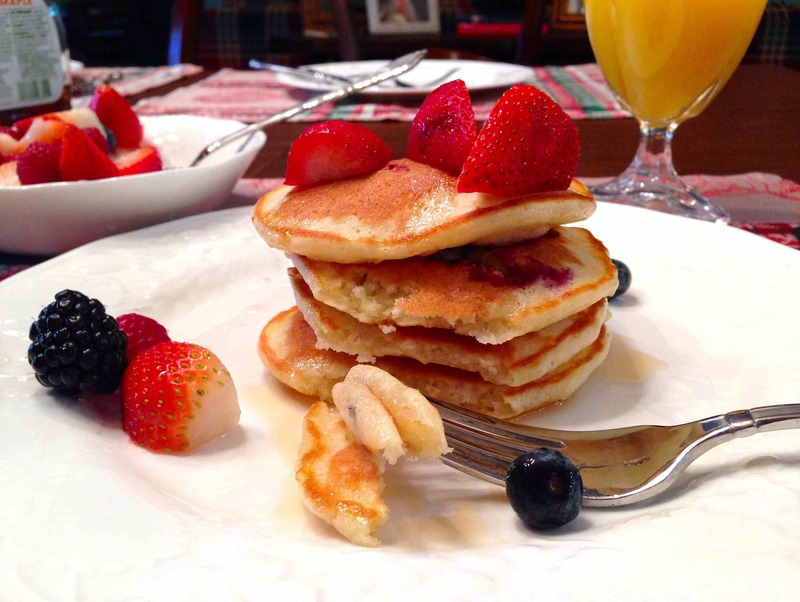 Garnish pancakes with fresh fruit. Confectioners’ sugar goes great with the blueberry pancakes while cinnamon-sugar goes great with the banana-walnut pancakes. 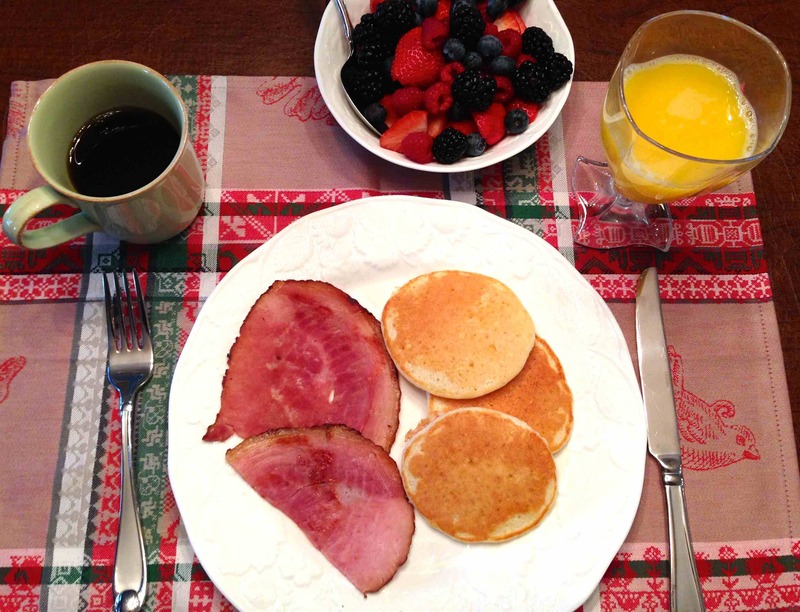 We also pan-fried some ham to go with the pancakes for protein! These pancakes don’t just have to be served on Christmas Day. We definitely plan on making these next weekend and Saturday mornings to come. Enjoy!! Sift flour, baking powder, sugar and salt in large bowl. In a medium bowl, whisk together the yolks, milk, melted butter and vanilla until combined. Whisk yolk mixture into flour mixture until just combined; the batter will be slightly lumpy. Place egg whites in the bowl of an electric mixer fitted with the whisk attachment, or whisk by hand, until *medium peaks form. Gently mix half the egg whites into batter with a rubber spatula. Gently fold in remaining whites. 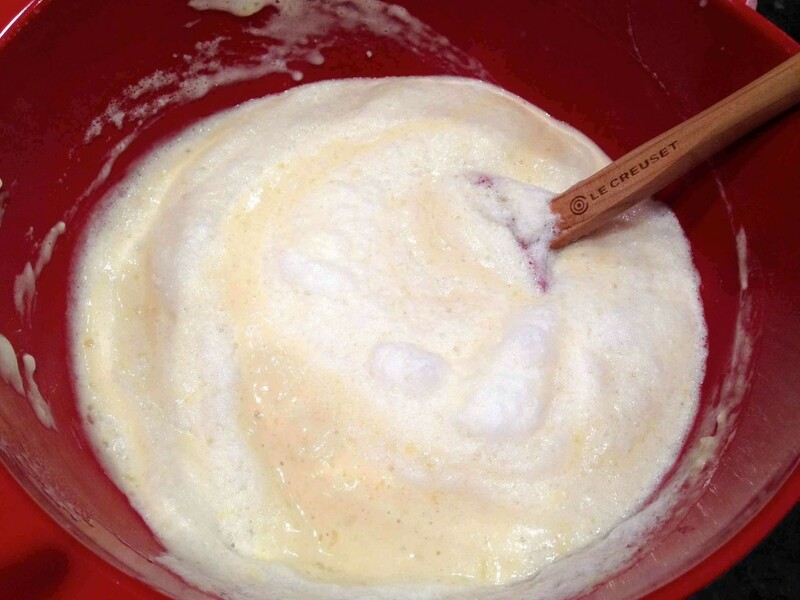 The egg whites should not be fully incorporated into the batter. Heat a griddle until hot, about 350-375 degrees. Add remaining unmelted butter to hot griddle. 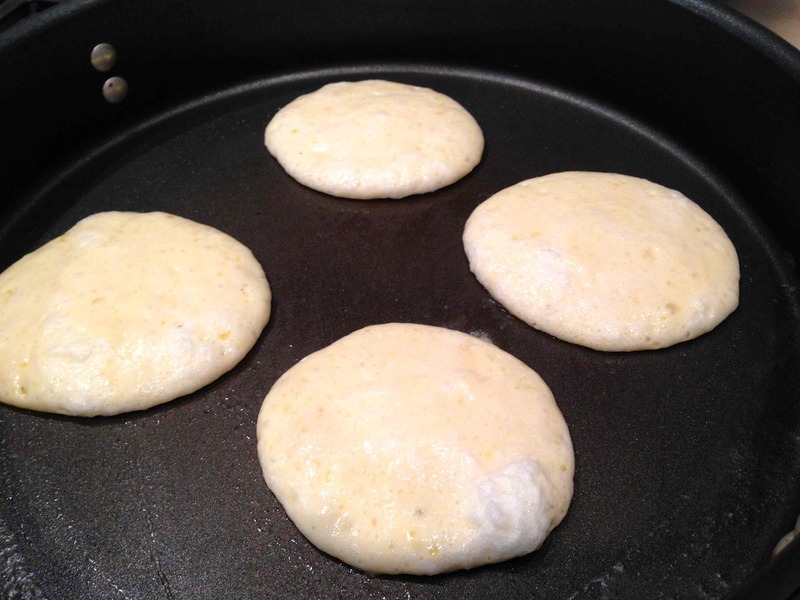 Add ¼ cup pancake batter and let set. 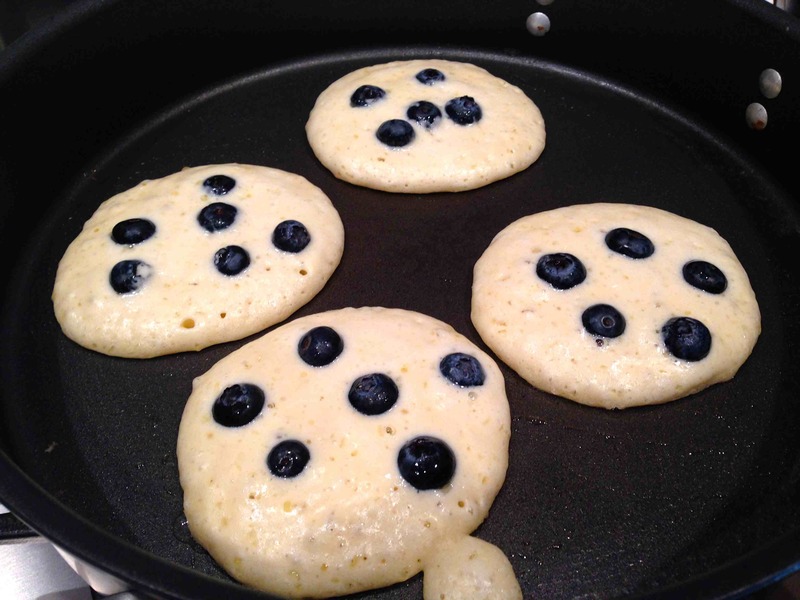 Sprinkle 1 tablespoon blueberries or sliced bananas and 1 teaspoon chopped walnuts, if using, over pancakes. When bubbles begin to form, lift pancake; if golden brown, turn. Cook until golden brown on remaining side. Transfer cooked pancake to a plate and keep warm. Repeat process with remaining batter, fruit and nuts. 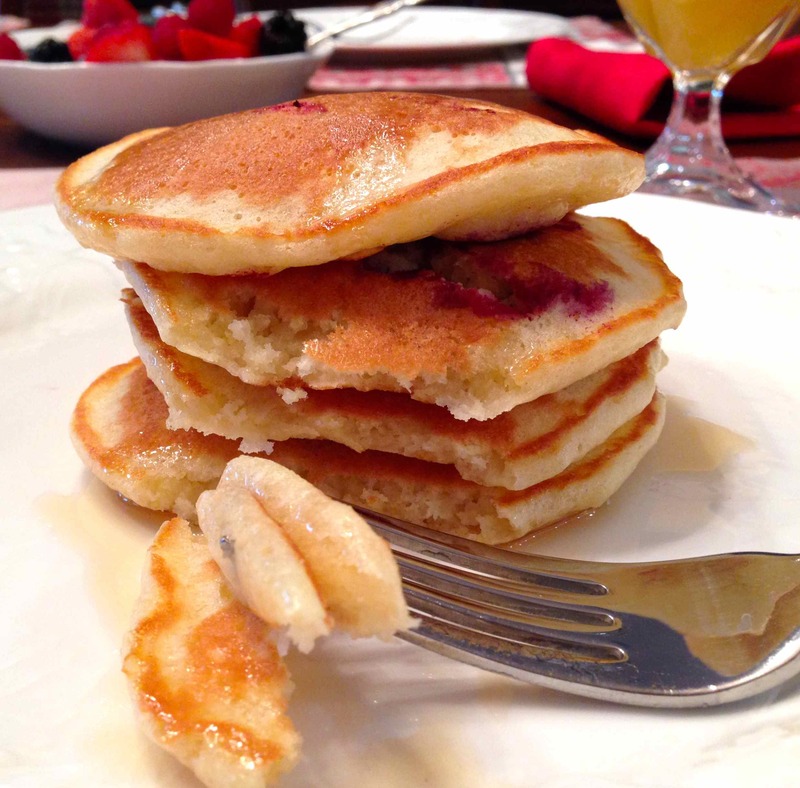 Garnish with confectioners' sugar for blueberry pancakes and cinnamon sugar for banana-walnut. Serve warm with pure maple syrup. *Peaks are "soft" when you put your finger in the whites and they fall over. Peaks are "medium" when you put your finger in and they drip over a bit and stand up. "Stiff" peaks develop when you whip the whites longer and they stay up.